My departure from the hotel, a B&B chain in the St Pierre quarter, felt quite grim. Breakfast was nice, with a descent quality and quantity of food, and there was a friendly atmosphere in the dining room. But the weather was grey. All these hot sunny days that we have been experiencing recently were all but gone. At least it wasn't raining. My front tyre pressure wasn't high enough to cope with the heavy load I was carrying. 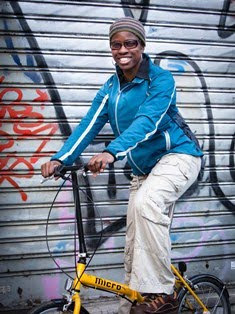 Luckily I found a bike shop close to my hotel (Brame Sports Defy Scoot) and they were able to put some air in. I always find it better to use a machine if I can possibly find one. That delayed my start a little, and it was delayed further when I stopped at Calais Town Hall. On this current cycling trip, which includes the Chateau de Chantilly triathlon I aim to include castles and monuments where possible. On my arrival in Calais a couple of days ago I was struck by how run-down some parts of the town were. 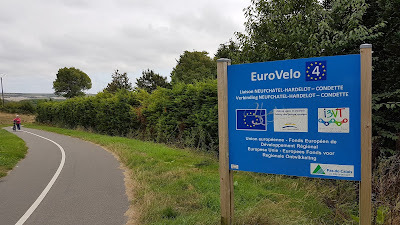 Cycling down the unaptly named Quai de la Loire, was a bit depressing - particularly when you just roll off the ferry excited to be in a new place and are just confronted with disused industrial buildings, undesirable looking social housing, all along worn-out roads . I wanted to name this place "forgottenville". It didn't seem to be on any public service radar. Thankfully things improved on the appearance front the following day. The town centre isn't bad at all. 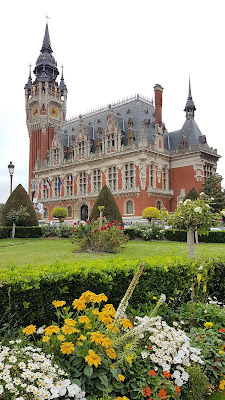 In fact I took a photo of this really impressive looking building, Calais Town Hall, with its belfry, or bell tower. Construction of it began in 1885, and it was completed in 1925. The building was originally built to commemorate the merging of Calais, and the then city of Saint Pierre, which is now an area of Calais, and the place where I stayed. 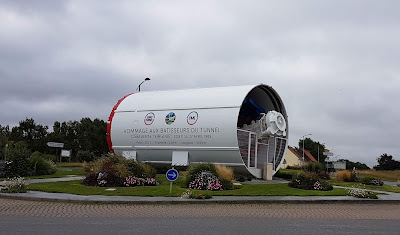 A more recent monument that I stopped to photograph was one that honours the people who constructed the Eurotunnel. This is one of the drills used to make the tunnels. There were six, and each one was named after the wives or daughters of the engineers. This one is Virginie. construction of the tunnel. Two men on the French side, and seven on the UK side were killed in fatal accidents over the six years it took to build the tunnel. I don't know if a similar monument exists in Kent. If there isn't I think there should be. Apparently one of the tunnel boring machines on the UK side was sold on eBay for £39,999 to a scrap metal dealer, with the proceeds of the sale going to local charities. During my ride I passed various relics referencing the World Wars. There was a military cemetery at Wimereux, and a museum at Ambleteuse showing the machinery, vehicles and aircraft used. Some people seemed to have acquired remnants of machines as features in their gardens. I find that a bit macabre. 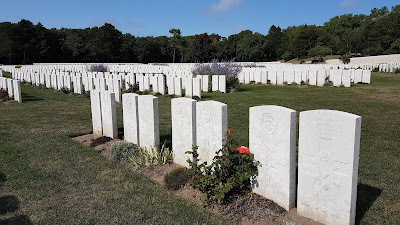 Also along the ride were a few military cemeteries, notably one at Etaples, close to Le Touquet. Over 11,500 soldiers are buried there, mainly from World War I. It's really freakish to see so many graves ordered row after row for a few hundred metres. Some of the graves have people's ages - barely 21 years old. Overall, I had a pleasant ride, but it was tough work. As experiènced on previous occasions, the coastline is quite undulating, and made worse when you have 15kg strapped to your rear end! In the early part of the route I was very close to the coast, and the Kent coast with the White Cliffs of Dover were clearly visible. After all, they are only 21 miles away. People were also stopping to visit the two promontories, Cap Gris-Nez, and Cap Blanc-Nez. The area is known as Pay des Deux Caps and part of the Côte d'Opale. It's not quite the same feel as the Côte d'Azur in the South of France, but it is worth a visit, and can be done as a day trip from the UK. You can do a few walks and play in the sand dunes not far from Boulogne sur Mer. This could be a great area for a cyclocross race! I only stopped at Boulogne briefly, and just found it to be another monotonous northern coastal town. There might have been fun things in the town centre but I was keen to push on to Le Touquet. Calais to Le Touquet can be cycled via the N940. Although it is a main road it is not so busy because a lot of traffic is on the parallel A16 motorway. So the vehicles en route were leisurely tourists in cars and camper vans from mainly Holland, Belgium, Germany, and the UK - hardly any French. After Boulogne I decided to leave the main coastal road, and went inland over the toughest climb of the day - rue de Clocheville, just outside Outreau. It lasted about 1km and was about 7 or 8%. This was a big Strava segment, and I am guessing I must be bottom in the rankings given how slow I sauntered up! The other big Strava segment was the run into Etaples. From Hardelot you region the N940, which is now an inland road, and there's a cycle path alongside it that is part of a Eurovelo network. It is a flat and fast, ideal for those wanting to do a time trial and really push out the Watts. I saw quite a few club cyclists doing just that! I could definitely see a gradual improvement in the status of the different towns I passed through. Calais had seemed like a backwater - literally, that was somewhat neglected. Things were only slightly better in Boulogne, but by the time I got to Etaples, just outside Le Touquet things were definitely looking upmarket. 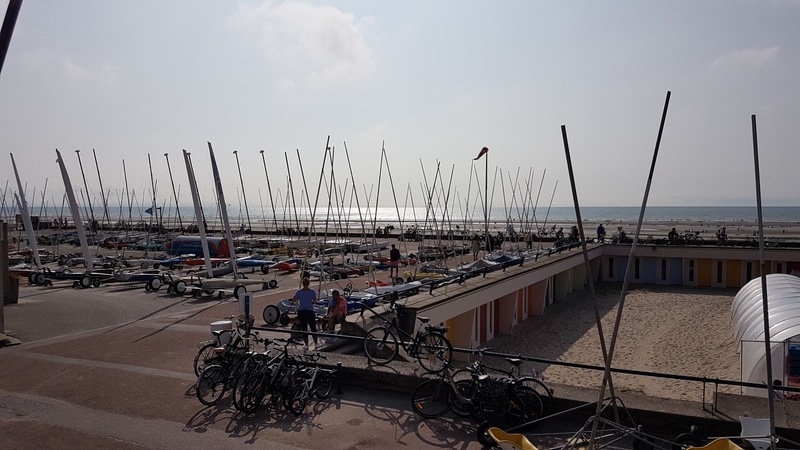 Le Touquet (aka Paris-Plage) looked like the type of place where Parisians may well have a little pied à terre by for their weekend getaway by the sea, or where they could go for a bit of golf, tennis or just hang out in a health spa. Having said that, I don't know if the characters there were necessarily any nicer than you'd find anywhere else. As I stood on the bridge checking out the view, a geezer stopped and asked if he could help me with directions. I politely declined, saying that I knew where I was going. He was a little insistent saying that as a local he could show me the short cuts which aren't always clear on a map. "I don't need a map around here when there's this signposted cycle path! I'll be fine" I replied. Oh dear, he wasn't too happy and gave me a "Suit yourself, followed by an indignant Gallic shrug, punctuated with "mauvaise route". Gee this guy must have been really having issues! I hope they're not all like that in Le Touquet! After a snack stop at the beach I called things a day, and got on the train to reach my lodgings in Abbeville. It would have been good to do the whole 80 miles by bike, but I am not fit enough to do it that quickly, and I just didn't want to be still riding at 8 o'clock at night. In any case I had done 52 undulating miles, and that was good enough for me.